Not too long ago, I gave you a tour of the campus and curriculum of the Culinary Institute of America, offering you a sniff of what they’ve got simmering in their kitchens: a “z”- or a cause- for plenty of the why’s, clarity to the kitchen’s pots and knives, tasting of foods that give meaning to our lives and plenty of thoughts and words that stimulate the minds appetite. The Navy’s Culinary Specialist (CS) “A” School, though is another animal, perhaps of the same class but definitely of another species. As mentioned, the school stands on an Army post, surrounded by other branches of military and all sorts of individuals, having taken fortress at Fort Lee to learn one of a number of trades. 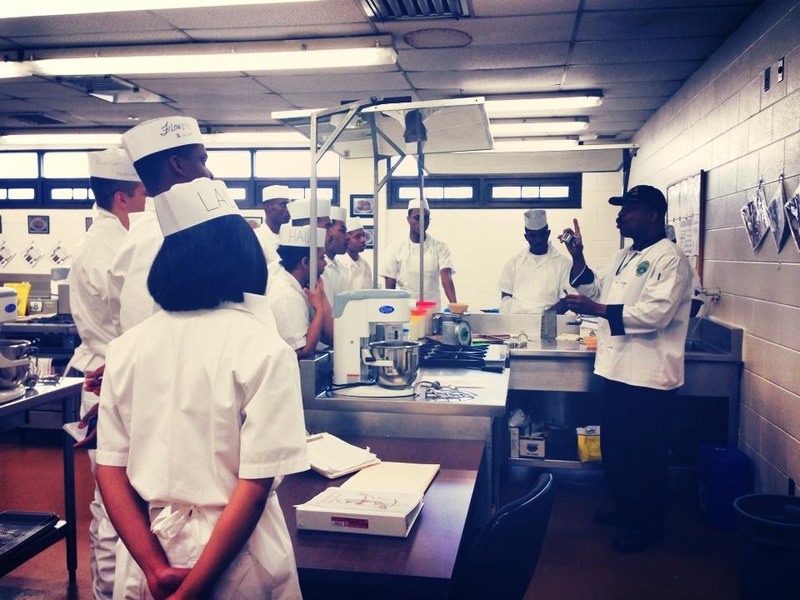 Some of those who were within the culinary or foodservice training were present by assignment rather than choice. I experienced some sort of friction, trying to inflame some of my shipmates with my passion for food. The romance that fuels my work rivals the heat that caresses the bottom of a pressure cooker, starting off at a simmer. The tiny bubbles of gas grow larger, increasing its energy, pressing against the lid, just waiting for the opportunity to blow, releasing that which has been suppressed. The things I’ve been taught and exposed to only create a hunger for more- a craving that my colleagues would way to easily rather a allow a Big Mac to appease. They didn’t care to hear of such tales of terroir, nor did they have interest in what transforms sugar, in any food source, to caramel. It was even very rare that an instructor taught us from such perspective. 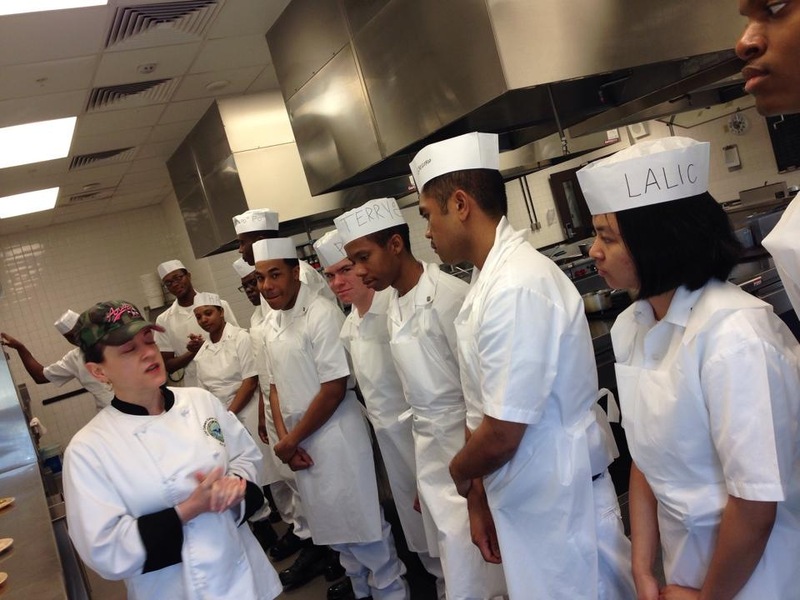 Our training began with the chain of command within the galley, the Navy’s dining facilities. Everything else mirrored a traditional school curriculum in an abridged fashion (rather than a condensed version )…C’mon! What do you mean what’s the difference? Abridged is chopped and screwed. Cut this. drop that. Condensed ain’t nothin but the original, boiled all the way down! Get rid of all the excess, water, and filler. Adding a depth of color, flavor…and knowledge….in a smaller bite. Bigger bang for every buck. The point is, we were served the basics, covered all the bases, but never ventured into the outfield. We were given training in safety and sanitation, nutrition, equipment, math… the quick rundown. No one fileted a fish. We didn’t roast bones for stock. Yet, I’m not sure we’d use these skills in the Navy’s galleys anyway. We didn’t explore alternative diets or certain foods effects on the body. We did discuss the results of some nutrient deficiencies. I think it’s a point that the first two weeks is bound in a packet 3/4 inch thick and the last 3 less than that. Granted, we are comparing a 5 week program to a 21 month program. But as far as I’m aware, the Navy’s primary objective is not the preparation of a fleet of chefs. We train to feed the rest of the fleet. As long as we get them fed, mission accomplished (probably now, more than before, with interest in tickling their taste buds). Once we began the hands on training. 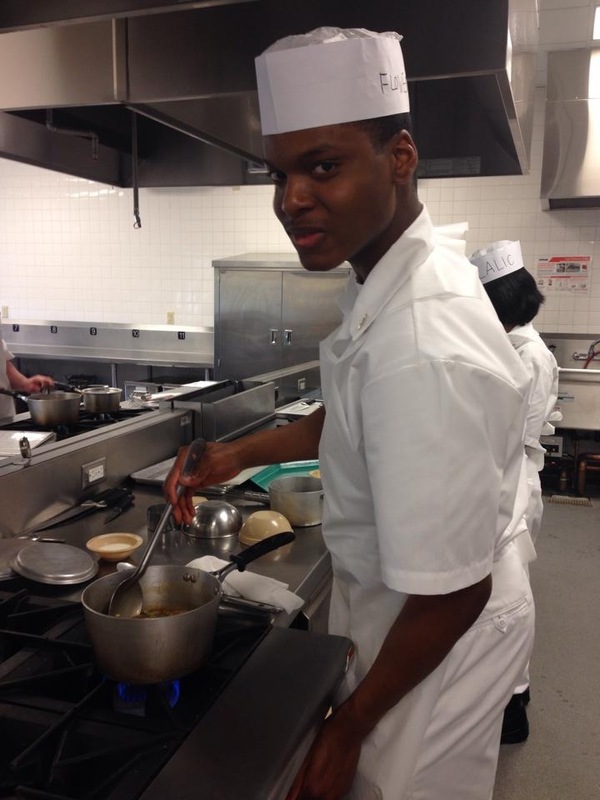 I was glad to be in the kitchen yet again, standing on familiar soil. I remember posting on my twitter that having had been away so long (considering I joined the Navy 12 weeks prior to commencing culinary training), simply cutting a potato made me happy. I was enjoying the class mostly but didn’t feel we were learning much, not just because of prior experience. We learned more so how to follow a recipe than to cook, granted that the job of a Culinary Specialist is to prepare meals in accordance with instruction following the recipe card. Nevertheless, comparably, the job of many restaurant cooks, and the fate of some CIA students, is to reproduce the house recipes without deviation. Still and yet, you can better follow a recipe when you comprehend the concepts that construct it. A few days ago, I bit into some glazed carrots that were definitely glazed. Unfortunately, WolframAlpha defines glazed as being fitted or covered with glass These glass carrots weren’t cooked! In his defense, the cook offered the recipe instructions: Cook for five minutes. But the recipe called for sliced carrots, not the baby carrots he lugged into the pot. But if he were trained not just to cook but to be a cook, it would be no big deal ; just cook the carrots longer! At “A” school there were a few tips here and there, some troubleshooting opportunities but I wanted more! I would review the next days slated recipes but arrive to class to find many omitted, without much discussion of what was to be learned from the dish. It might have been the particular instructors fault but I think we could have better grasped the ideas of teamwork and multitasking for the sake of a more efficient kitchen. We sliced peppers, chopped and diced onions, broke down a chicken and did a bit of sauté. As much as it may seem a given to taste as you go and especially before you serve, many of us don’t think to do so, especially when following a recipe. This is a trait that I learned at the CIA and unfortunately didn’t relearn as a CS. When critiquing our product, it was primarily a visual thing. The instructor never laid a morsel on her tongue, and I could understand why but it’s something observed at the CIA and I think is beneficial to the growth of a cook. I looked onward with greater optimism for baking. It’s an area I was less familiar with and therefore I felt there was greater room for enlightenment. The day came and I was not disappointed. The instructor had a love and passion for baking and left no doubts about it. He ensured you were convinced of his expertise. (Might have something to do with the fact that he’s Panamanian). But he was energetic and saw to it that we too enjoyed the job, a believer that once you love what you do, you won’t work another day in your life. I was pleased with his style. Prior to his demonstration he would have pre-selected teams measure out for the class the ingredients needed for the days goods. Just my luck, I was assigned to weigh the flour each day. The first day, the flour was mixed for quick breads: biscuits and muffins. Other days it was transformed into cookie dough, dusted over pie dough, sifted into cake batter, and worked into sweet dough (cinnamon rolls) and yeast rolls. My measuring the flour demonstrates the teamwork and efficiency that required a team of at least 3 to wash all equipment rather than each individual crowding the sink to wash a mixing bowl (of course in combination with the clean as you go policy). Rolled into every layer of each golden brown biscuit and baked into every cookie crumb is an understanding of the “why” and how the different ingredients combine to complement and transform each other. Technique and finesse were taught and encouraged. He didn’t taste our food either, but he had some other things working for him. I can’t fairly compare the baking taught here to the Culinary’s because I’ve not yet completed that portion of the CIA curriculum. I do know that students explore in greater depths the different types of breads, and serve custards. The final leg of CS “A” School was the galley. We’d take all we had thus far learned and demonstrate it in preparing breakfast and lunch for 50 each day. As for receiving, that’s something we didn’t discuss much of. At the CIA we would spend sometime participating in receiving, observing quality inspection, ensuring that everything was up to the ordered specs. Again, the culinary sought to train our senses to prepare and recognize quality and freshness. A good meal begins with good ingredients. Culinary preparation in the Navy isn’t as much about freshness of the product as it is about preservation of the sailors it comprises. Ever heard of a ship’s biscuit? Salt beef? We take what we can and make the best of it, working to allow our sailors to perform at their best. Thanks to technological advances, we’re not bound to the ship’s biscuit and salt beef, two foods created out of necessity, in absence of refrigeration and other conveniences. While we can afford to make quite a buffet of foods today, even borrowing from the cuisines of the globe we travel, the ship’s mission maintains priority. With a kitchen floating at sea, or under the sea in some instances, for any length of time, our selections can be limited, usually due to space constraints. Circumstances, particularly underway or underwater, may require instant mixes, frozen foods, and can openers. Sometimes you just have to work with what you have; it just seems that at the Culinary Institute you have lots more to work with. Different mission; different provision. Now this is no intention to discredit Culinary Specialist “A” School instruction, however, I do miss the Culinary Institute of America. It is understood that the fleet has work to do and that our needs may require training to be completed onboard, on the job, and yes, training and nutrition have improved significantly over the years. But there’s a place in my heart only to be filled by CIA (sniff, sniff) and occasionally, I must ensure that nothing is allowed to clog or obtrude that space, that I don’t let go of the dream. We must be careful not to settle for okay, or even good, when we were made for excellent. 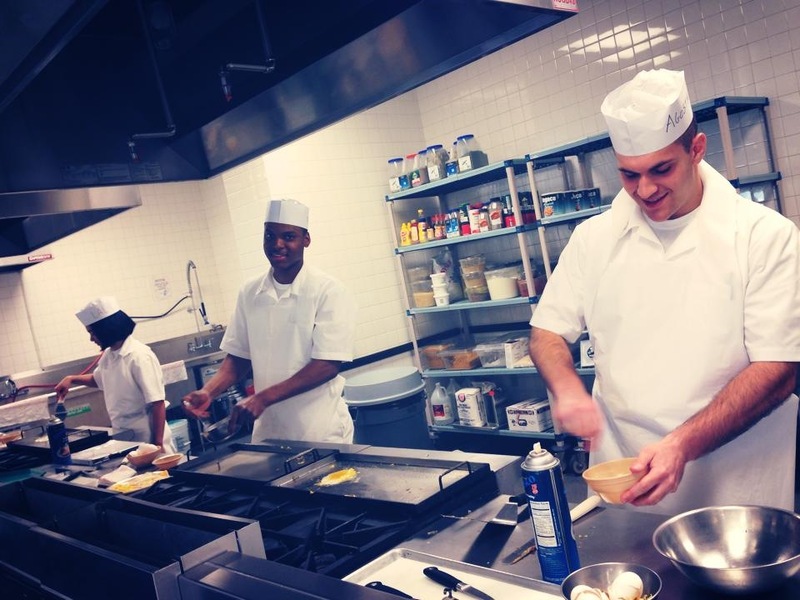 The Navy’s CS program is a prerequisite for being a cook in the Navy, regardless of prior experience . It’s a necessary step in the path I chose, a path whose twist and turns will guide me to a debt free education from the Culinary Institute of America. In fact, the Navy offers a program that pays for 3 certifications offered at the CIA among many others. I am undoubtedly navigating the currents to the Hudson River, the Culinary’s backyard, in ground pool. As for you, “don’t get stuck in the hallway while on your way to destiny” (Andre Landers).